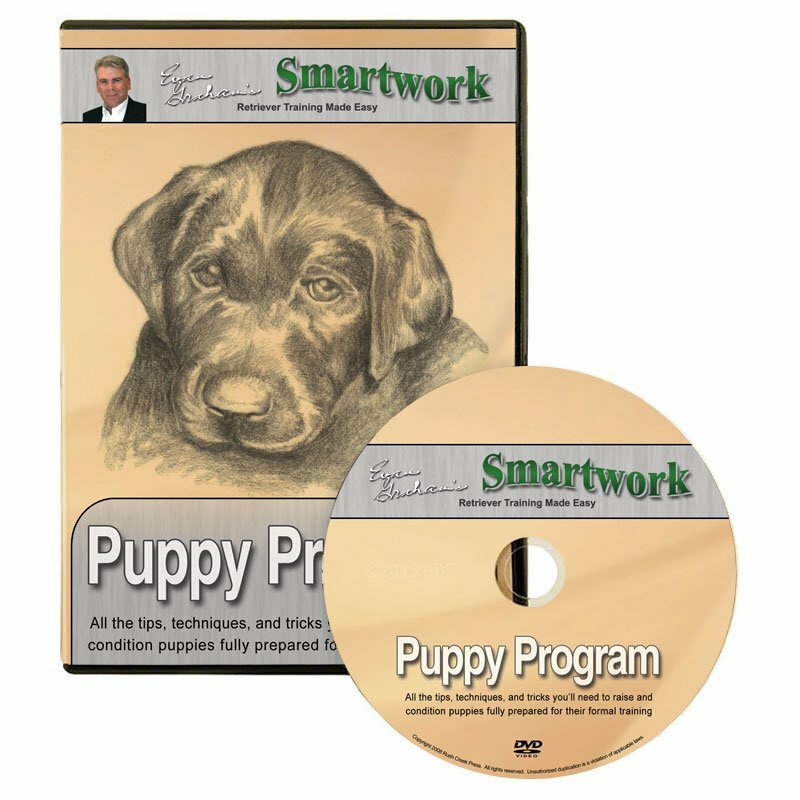 Smartwork Puppy Program DVD by Evan Graham. $29.99. Perfect for the new trainer and puppy owner. Glad I got it. Best program I have ever seen on developing a retriever puppy. Evan Graham's Smartworks Puppy Program has played a pivotal part in the success of my pup's training. Very elementary information. Not worth the price. Fresh and up-to-date information designed for retriever puppies. As part of the growing Smartwork DVD series, Evan Graham presents this fresh and up-to-date information designed for retriever puppies in their vitally important first six months. Evan Graham's Smartwork Puppy Program is designed to properly see you and your pup through the critical first six months of life: marking, socializing, obedience and much more, including all the tips, techniques, and tricks of raising and conditioning your puppy to prepare him for his formal training. Smartwork is a system I developed over 30 years and is presented in a multimedia format to provide the premier learning tool for aspiring trainers. The three books, Smartwork for Retrievers Volume I: Basics and Transition; Smartwork Volume II: Secrets of the Pros; and SmartFetch constitute the full system. However, to allow ease of learning and a fuller understanding of the material, we provide a growing collection of DVD modules of the system. Each DVD module offers the most detailed and graphically illustrated explanation of the steps of development for your retriever available anywhere! We include all the sequential steps and tips you'll need to do your own training with your dog and develop him or her to the highest level you desire. In addition, in future DVD productions we will be presenting even more instruction beyond that which is contained in our books. Handling, marking, practical hunting applications, and competition-based instruction are all proposed for future productions. The cost of each item has been kept at an affordable level to allow you to expand your library of information at your own pace while giving you the information you need to enjoy the pride of having done it yourself! This will continue to be our commitment to you. NOTE: Because it is important to me that my system is presented as it is intended to be used, we shoot all our own video and do all our own editing and DVD production. No non-dog trainers participate in this process, and that has allowed each presentation to be geared toward the trainer exclusively. No aspect of our information has been watered down, modified, or omitted because of production concerns. Every effort has been made to assure that this program is enjoyable to watch while sparing no effort to provide extensively detailed instruction.